We're upgrading how HTML boxes work on classic Sites. This will improve performance and security, but it may also change the look and feel of some embedded elements. Site editors may want to make some simple adjustments so embedded elements appear the way they want them to. Note that this only affects sites managed in classic Sites. Sites managed in new Sites are not affected. Improved appearance of rich embedded content (e.g. Twitter images, buttons, and more). Different display size of the embedded element. Different styling of the embedded element. Adjust the height and width. Use the manual controls (pictured below) to make the box fit the embedded content better. Adjust the formatting. You may want to adjust the embed HTML to match your page style. If you got the code from a third party, check if there are formatting options there. 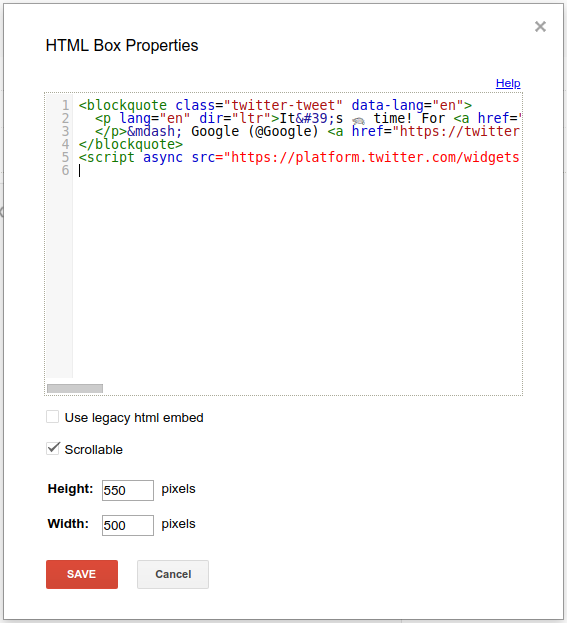 If an editor wants to revert back to the legacy embedded element appearance, they can check the “Use legacy html embed” option. The embedded element will then appear the same as before until the automatic upgrade on June 30th (see below). Stage 1: Starting immediately, we’ll upgrade HTML boxes when an editor opens an HTML box on a classic site. Stage 2: On June 30th, we’ll automatically upgrade all remaining legacy HTML boxes.